Note: Our February meeting for 2019 will be on THURSDAY, February 21. UPDATE: We are encouraging everyone to bring their own mug or cup for hot tea or coffee. The guild provides tea and instant coffee, plates and napkins. We will have some drink cups available as well. We will be making Thread Catchers of felt. You do not need to bring any supplies unless you have special items you would like to add for embellishment. Reba will have supplies and instructions. The CNCH Conference for 2019 will be held at Sonoma State University, June 20-23. Registration opened January 15, 2019 and will be open thorough March 15. Many workshops are full, however there are some spots still available in several interesting workshops. 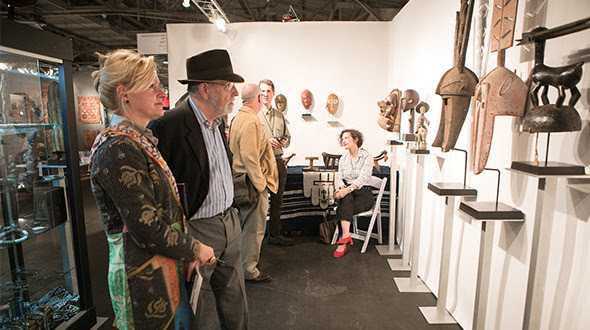 One of the most important tribal art fairs in the world, the San Francisco Tribal & Textile Art Show exhibits exceptional artwork and textiles, including many rare pieces from Africa, Asia, Australia, Oceania and the Americas. The fair will feature two special exhibitions — one with art from Fiji and another celebrating Africa’s vanishing rituals through photography.